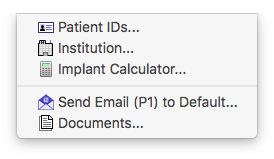 Patient IDs... - Opens the Patient ID window where you can enter the patient name and other plan identifiers. Institution... - Opens the Institution window where you can enter the institution name and professional identifiers. Implant Calculator... - Opens the Implant Calculator window. Access to the calculator window is provided here as a convenience, it is the same as clicking the Implant Calculator button in the Prescription window. Send Email... - Sends an applescript template to the MacOS Mail program, addressed to the current institutional team, tailored for the currently active plaque's treatment plan. You can then drag and drop a secure .pdf version of the treatment plan into this template to send it to the team members. Documents... - Opens the Document Preview window. Access to the document window is provided here as a convenience, it is the same as selecting Documents... from the Window Menu.